Guatemala: ancient ruins, beautiful landscapes, mayan villages, and…chocolate. Chocolate, really? That’s right chocolate fans; cacao is endemic to Guatemala, and Guatemalans were the first to invent hot chocolate! While chocolate alone is enough reason to visit Guatemala, this vacation offers even more, and Monograms made it easy for you! On this 6-day vacation, we’ve arranged your hotel reservations, sightseeing, transportation between cities, and daily buffet breakfast. Plus, we’ve arranged for you to have a Local Host® in Guatemala City, Antigua, Chichicastenango, & Lake Atitlán. This is a one-of-a-kind service offered by Monograms to make sure you have someone in each city who can answer your questions, offer suggestions, help you navigate your vacation, and be there for you to make sure your vacation runs smoothly. When you arrive in Guatemala City, your Local Host will greet you with a warm welcome and transport you to your hotel. The next morning, after an included breakfast, we’ll pick you up at your hotel for your private sightseeing with a local expert. Antigua is a UNESCO World Heritage Site and one of the Americas’ oldest cities. Among other places, we’ll show you the Catedral of San José and the ruins of churches and monasteries. Guatemala is the world’s leading producer of jade, and we’ll take you to a jade factory for a tour. The next day, in Chichicastenango visit the Church of Santo Tomás, where you’ll witness ancient Mayan ceremonies, and the open-air Indian market, where you can barter with the locals for goods and souvenirs. Continue to Lake Atitlán, a beautiful lake surrounded by twelve Indian villages. 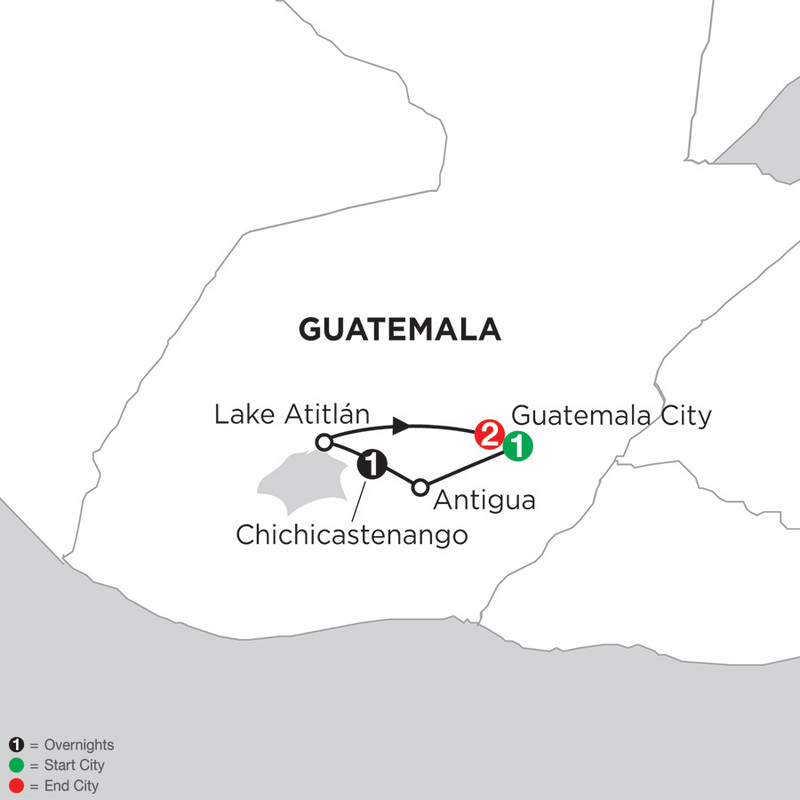 After your Lake Atitlán adventure, we’ve arranged private transportation back to Guatemala City. And did we mention we’ve arranged all your private transportation for you, so you can just sit back and relax as your guide takes you from place to place? Add the time saved and the comfort of knowing you’ll have a local there to assist you throughout your vacation, and you’re a lucky traveler! Your Monograms vacation package to Guatemala includes a visit the colorful, open-air Indian Market, where hundreds of Indians from the surrounding countryside gather to barter their goods and products. This is the ideal place to shop for souvenirs! Welcome to Guatemala City. Your hotel is available for mid-afternoon check-in. Depart for Antigua, Guatemala’s capital from 1543 until, after a devastating earthquake in 1776, it was moved to Guatemala City. The UNESCO World Heritage Site of Antigua is one of the Americas’ oldest and most beautiful cities, with pastel-colored buildings, wide cobblestone streets, and a beautiful natural setting ringed by three volcanoes. This morning, our PRIVATE TOUR of this magnificent highlands city, known for its 16th-century Spanish Colonial architecture, includes lively Plaza Mayor, flanked by the impressive Catedral de San José and Palace of the Capitanes Generales. We also see the ruins of churches and monasteries, some with hidden underground passages destroyed by the earthquake of 1776, and take a tour of a JADE FACTORY. Later in the afternoon, transfer to Chichicastenango for the night. Today, with your Local Host, discover the whitewashed highland town of Chichicastenango to visit the colorful, open-air INDIAN MARKET, where hundreds of Indians from the surrounding countryside gather to barter their goods and products. Also, visit the Catholic CHURCH OF SANTO TOMÁS to witness ancient Mayan ceremonies that have long been practiced there. Continue to the shores of Lake Atitlán, surrounded by volcanoes and indigenous villages. Lake Atitlán is the ideal place to come in contact with native Guatemalans. Twelve Indian villages surround the lake, and their inhabitants are descendants from the great Quiché, Cackchiquel, and Tzutuhil Nations. Head back to Guatemala City for the night. Today is at your leisure to explore Guatemala City or perhaps take an optional day trip to the Mayan ruins of Tikal. The Barcelo Guatemala City hotel is set right in the heart of the city in the main business district, and surrounded by restaurants, shops and places of entertainment. Its elegant 383 rooms offer high-speed Internet access and numerous facilities to make your stay an enjoyable one. This elegant and stylish hotel is located in the city center near the main business district, offering easy access to restaurants, shops, and entertainment. With plush bedding and softly decorated rooms, great service, and hospitality, your stay in Guatemala will include all the comforts of home. Situated in the middle of Chichicastenango, the Mayan Inn is a historic hotel featuring colonial architecture, Guatemalan art, authentic antiques, and colorful fabrics that give a touch of charm. Centrally located in Chichicastenango with shops, restaurants, and local area attractions within walking distance. Individually decorated guestrooms feature colonial architecture and design, Guatemalan art, cozy fireplaces, as well as modern amenities including cable TV, in-room safe, hairdryer, and ceiling fans. The Westin Camino Real is a sparkling retreat in the heart of Guatemala City. Just minutes from local shopping and entertainment, The Westin Camino Real, Guatemala is a stylish and elegant hotel. Guests will enjoy our location, convenient to business and local culture. Offering a variety of services to make your stay more relaxing, you will leave The Westin Camino Real feeling refreshed and reinvigorated. Spend the day by the outdoor heated pool, play a game of tennis, or renew your body and mind in the fitness center. Comfort and elegance combine at the Westin Camino Real in Guatemala City to ensure your stay is memorable and relaxing. Luxury meets convenience, as the hotel is located in the city and close to many activities. You can return to the hotel after a busy day to find relaxation at the pool or spa, delicious cuisine, and a variety of superior services. Monograms provides travelers access to a Local Host®, so you will have someone on hand to answer those vacation questions pertaining to Guatemala City, Guatemala. No waiting in line at the concierge desk or trying to ask your waitress at breakfast directions to the shopping district. Simply ask your Local Host about Guatemala City and you'll be on your way in no time. Plus, your Local Host will share local Guatemala City insights and share suggestions for getting off the beaten path, leaving you more time to create lasting vacation memories that are yours alone. Raised in La Antigua Guatemala, I studied Central American History at the University. Because I was born in a Mayan community, my major area of interest and study was mostly all of the Maya Culture. I keep particular emphasis on the importance of the diversity of Mayan languages and cultural linguistics of Guatemala. I love being a tour guide and opening up the world of Mayan culture to new visitors of my precious home country. A seemingly endless maze of underground passages is home to the Mercado Central, where handicrafts from the highlands are hawked from overstocked stalls. The leather goods, wooden masks, and woolen blankets found here are often cheaper than other markets. It’s a wild and bustling market so be sure to watch your belongings. A lot of fun! The grandiose National Palace was built between 1937 and 1943 to satisfy the monumental ego of President Jorge Ubico Castañeda. It once held the offices of the president and his ministers, but now many of its 320 rooms house a collection of paintings and sculptures by well-known Guatemalan artists from the colonial period to the present. The palace's ornate stairways and stained-glass windows are a pleasant contrast to the bustle of the city. Arguably the city's best museum, the Ixchel Museum of Indigenous Dress, focuses on textiles of Guatemala's indigenous community with an impressive array of handwoven fabrics from 120 highland villages, some of which date from the 19th century. It provides you with a good background in the regional differences among textiles before you head out to Guatemala’s country. You'll also find sculptures, photographs, paintings, and interactive weaving displays.